Do you know someone who wants to learn how to paint with watercolor? These videos and workbooks make the perfect gift! I have a set of 5 watercolor instructional videos on DVD that are specifically designed for the beginning painter - one who has little or no experience with watercolor painting. These are available for purchase as a physical set of DVDs (shipped from my studio), or you can view them online for a fee. If you prefer watching online, you can do so for a fee at Folio Academy.com. Click their logo below, then look for me under instructors, or the Painting category (watercolor). 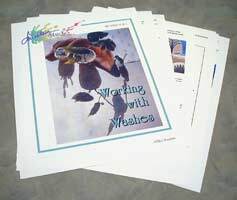 I also have created workbooks, complete with painting exercises for you to do, on a variety of topics related to watercolor painting. These are available for purchase through PayPal, and are emailed to you as a PDF file that you can either view or print.